For the second straight year, high humidity met Army Ten-Miler runners, but this year’s race was mercifully cooler. But last year’s conditions still stung Susan Tanui, so when the defending women’s champion set out, she made it a point to start out conservatively. It paid off, with a 56:33 victory over Julia Roman-Duval’s 57:17. Tanui improved by 17 seconds over last year’s time and Roman-Duval improved by two minutes. Tanui, a member of the Army’s World Class Athlete Program, is stationed at Fort Carson in Colorado. Roman-Duval lives in Columbia, Md. Emily Da La Bruyere, of D.C. was third in 59:07. She admitted easing up in the last two miles, but was happy to not be as desperate for water. Tanui will end her competitive season with the EQT 10 Miler in Pittsburgh before traveling to her native Kenya to visit her family. While the women’s times improved, the men’s winning time slowed from Haron Lagat’s 49:23 2017 winning time. The race remained an exhibition for the WCAP team, with recent enlistee Frankline Tonui edging teammate Evans Kirwa in 50:23. Kirwa, who was eighth in 2017, improved his time by 50 seconds. 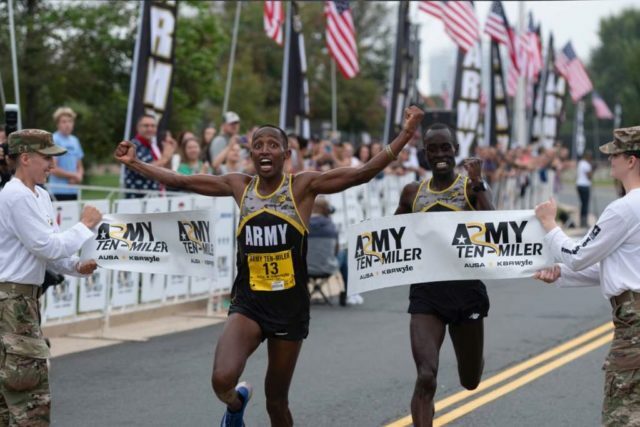 The team, however, was divided between the Army Ten-Miler and the U.S. 10 Mile Championships in Minnesota. The pair ran most of the race with teammate Girma Mecheso, who was third in 50:23. All three are based at Fort Carson. Tonui, an Ethiopian native who joined the Army May 1, ran collegiate at Arkansas. The course changed with the loss of the Arlington Memorial Bridge in the second mile. Runners took Route 110 to the Key Bridge and Whitehurst Freeway to Rock Creek Parkway. While that reduced congestion from the backups on the offramp at the first mile mark, cutting the uphill was a boon to the leading runners too. Gaithersburg’s Chris Sloane was the top local finisher in fifth place (51:50), outkicking Robert Cheseret (51:52) and George Kiplagat (51:54). Sloane was RunWashington’s second-ranked road racer in 2017, and a week before had run 1:54:16 at the National Capital 20 Miler on the C&O Canal Towpath. Sloane hung with Cheseret and Kiplagat as the trio dropped Elias Chesire. With a half mile to go, the Army pair goat away from him, but within sight of the finish line. “I had another gear and was able to outkick them,” he said. Slaone had finished 14th in 2017, more than 90 seconds slower (53:13), and while he appreciated the lower temperature, he wasn’t crazy about the humidity. “I know if I’m sweating before the race, it’s going to be rough,” he said. 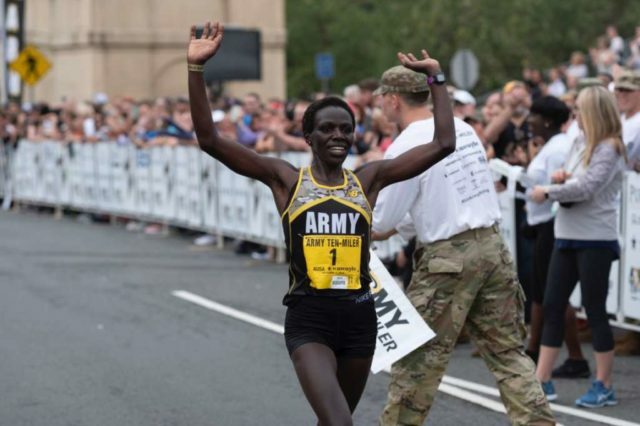 Susan Tanui breaks the tape at the Army-Ten Miler.